It was an honor for everyone involved with “ONLY THE BRAVE” to work with the legendary Noriyuki Pat Morita in one of his very last films. More than just another role for this popular star and Academy Award-nominee, Morita actually lived aspects of the real-life story that inspired this new motion picture. The son of migrant workers, Morita contracted spinal tuberculosis at the age of two and was taken away from his parents to spend the next nine years in a sanitarium confined in a body cast. After extensive surgery, he was finally able to walk. But the day he left the hospital, at the age of 11, he was met by an armed FBI agent, who transported him from California to the Gila Internment Camp in Arizona, where his family was already confined. They were later moved to the Tule Lake Internment Camp in northern California. Each week, when fresh newspapers arrived, Morita along with the other Japanese-American prisoners, early read the latest news of the 100th/442nd Regimental Combat Team’s battlefield triumphs. But there was also much to mourn as husbands and sons who had enlisted from the camp never returned. 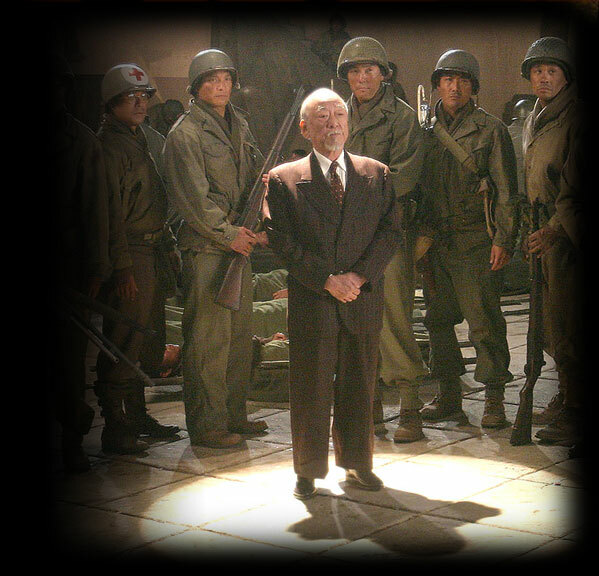 So dedicated was Morita to honoring these men that he personally appealed to “Karate Kid” director John Avildsen to re-write his Miyagi character as a 442nd veteran who had received the Congressional Medal of Honor for valor under fire. At the end of the war, the Morita family was released and settled in Sacramento, where his father opened a successful Chinese restaurant. His teenage son got his first taste of performing by entertaining the customers with jokes as the emcee for group dinners. Following high school graduation, Morita worked his way up to head of computer operations for an aerospace company. Itching to perform, however, he quit and followed his passion to Los Angeles, where he became a member of The Groundlings. An even bigger break came in the early 1980s, when at the age of 53 he beat out stiff competition to win the role that would make him a household name – as the wise teacher who mentors a young Ralph Macchio in “The Karate Kid.” The surprise hit spawned three sequels during the next decade.